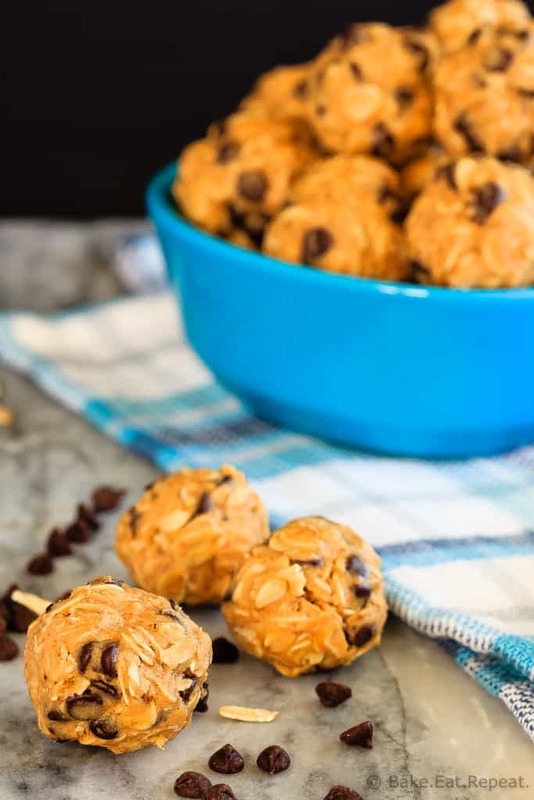 These 4 ingredient peanut butter energy balls are super quick and easy to make, and are a perfect snack or addition to the lunchbox! Plus a recipe video! I think I’m finally getting completely on board with the whole energy ball obsession. Which probably means it’s going to go away and be a thing of the past that no one makes anymore. That’s usually about the time I start getting into something – as it stops being popular. That’s okay though, these little snacks are here to stay at my house. They’re just so perfect as a grab a go snack when we’re running to various after school activities and sports. My daughter is at the pool for many, many hours every week (well, she thinks it’s not enough, and I can’t even imagine swimming as much as she does, so I guess it’s many hours depending on who is talking) and she is loving these energy balls. 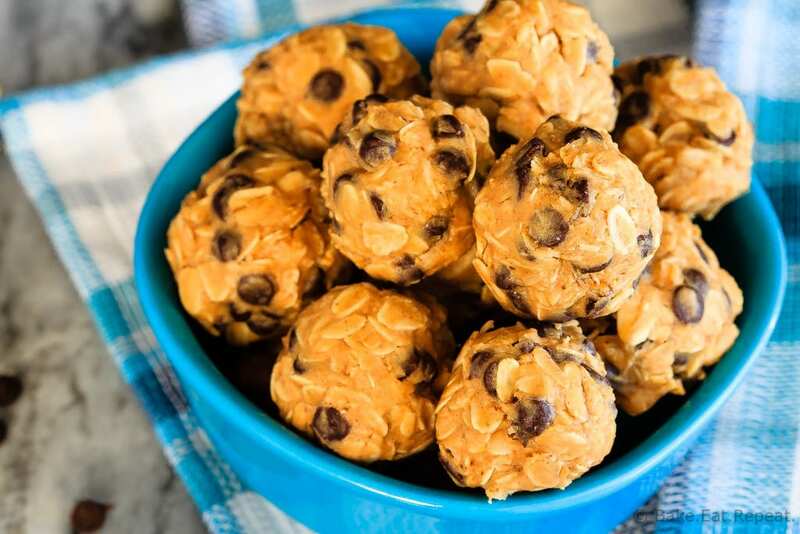 With only a few minutes to grab a snack to keep up the energy while swimming endless laps, these peanut butter energy balls are perfect. And I even like these ones! But, really, it’s peanut butter and chocolate chips so there’s not really any reason not to like them. These almond joy energy balls were pretty good. There was chocolate involved so I didn’t mind them. Didn’t love them like the kids did, but they weren’t bad. But these peanut butter energy balls? Chocolate involved and no dates. YES. I know, I know, dates are wonderful things that everyone loves and wants to put in everything. Except that I don’t. Love them, that is. I really wish I did, because they’re such a great way to healthy up your snacks while adding some sweetness. So I use them for snacks for the kids (thankfully they like dates! ), but I’m not really a fan. Maybe I’ll just stick to energy balls like this from now on. 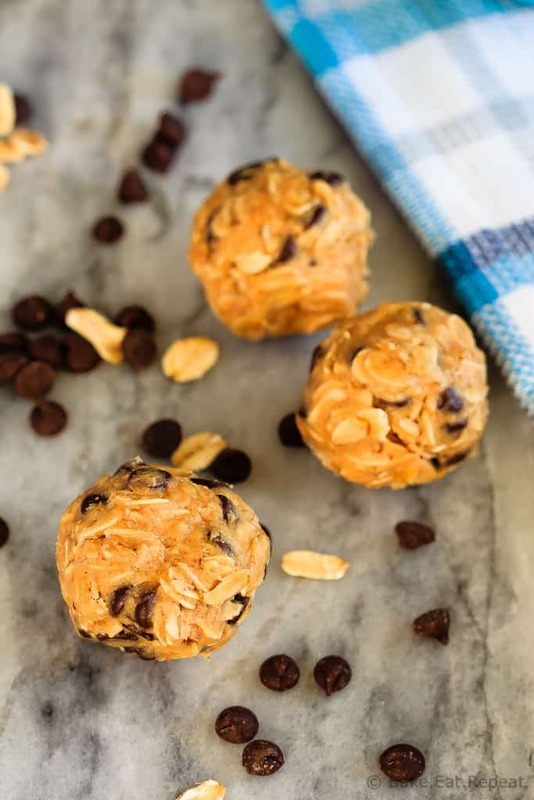 It’s like a peanut butter oatmeal cookie in energy ball form. Plus they’re so easy to make, with only 4 ingredients these literally take about 5 minutes to whip up. The only problem is there might not be any left to give the kids for a snack since I like them too! make sure to measure your peanut butter (I use creamy peanut butter, not chunky) correctly – if you don’t have enough they may not stick together so if you’re having trouble add a couple more tablespoons – I love this measuring cup for measuring sticky things like peanut butter accurately! I’ve also shared this Peanut Butter Energy Balls Recipe over on Food Fanatic.